The definition of Na can be found on Wikipedia so I won't go into detail, but I doubt that some of the greatest song writers in history were serenading Sodium. In this context, Na (and it's subsequent repetitions) is the symbol for sheer bloody laziness. While this may not be entirely accurate in every case, it does show a certain lack of imagination and also humor. 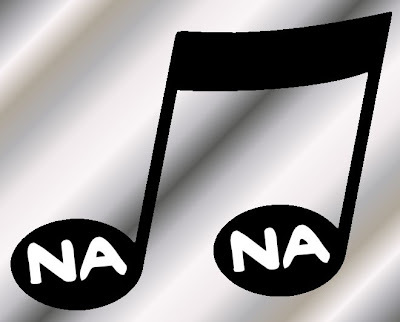 I have compiled a list of key 'Na Na' songs for each decade since the 60's. I decided to skip the 50's since there were a whole bunch of nonsense lyrics like Be-Bop-a-Lula, Shoopy-Doopy-Wop-Wop and Ooo eee ooo ah ah ting tang walla walla, bing bang. Since this post was written in a hurry with minimal research, you may well find better examples from each decade, and I invite you to add your personal favorites in the comments section below. I also avoided linking to soundbites because YouTube is always taking stuff down for copyright infringement, and quite rightly! Go Yahoogle! it yourself if you want to hear it. Possibly the longest Na Na song ever written, clocking in at a whopping 7:11. John and Paul were toying with the idea of writing a super long song, but were struggling with ways to stretch their material to 7+ minutes, and as yet, nobody had started the 800% trend or invented the PC on which to do it. Rumor has it that during a brainstorming session Paul asked John if he wanted another beer, and John replied, "Naaa", a Liverpool word for no. They looked at each other and suddenly 4 minutes of Na Na was added to the end of 'Hey Jude'. And Na-na is the saddest word is the saddest song. This was the one decade I struggled with and this was the only song I could find to fit the brief. I almost didn't bother with the 70's. This one wins on two counts. Not only are there multiple Na Na's in the song, but also a couple in the band name. They also look better than the runner up for the 80's Centerfold by The J. Geil's Band. Bananarama have the unfortunate stigma of being the most popular British band to never have a #1 single in the UK. Not to be confused with This Charming Man by The Smiths which also has some Na Na content, but was 7 years too early to be considered in the 90's category and not sufficiently endowed with Na's to win in the 80's. Sorry Morrissey. You have to check out the video for this one. Very entertaining. This song was actually the inspiration for writing this post. The Na Na's reminded me of the ones in Hey Jude even though they were not used to elongate the song. This is definitely out of the humor box. There where multiple choices for song titles, and yet they opted not just for Na Na Na, but for the addition of (Na Na Na Na Na Na Na Na Na). Now that's comedy. Talking of comedy, thanks for stopping by and reading today. Don't forget to add your favorite Na Na songs in the comments section, and if you know someone who would appreciate this or any of our other pages then use the social buttons below to share it with them. What about anything my Nana Mouskouri? Great list, but Depeche Mode not Bananrama are the most popular British band to never have a UK number one single, and they never had to resort to silly NaNa songs. Wonder if you've ever seen the John Sayles movie with that title. It's a favorite of mine. Roxette - Na na na na na, na na na na na naaa, na na na na na, na na na na na naaa, na na na na na naaaa you got the look.